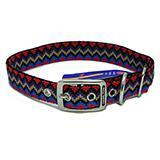 1-inch wide adjustable nylon dog collar in a colorful and stylish weave pattern. Fits dogs with a neck size of 20 to 24-inches. Double thick deluxe nylon material.